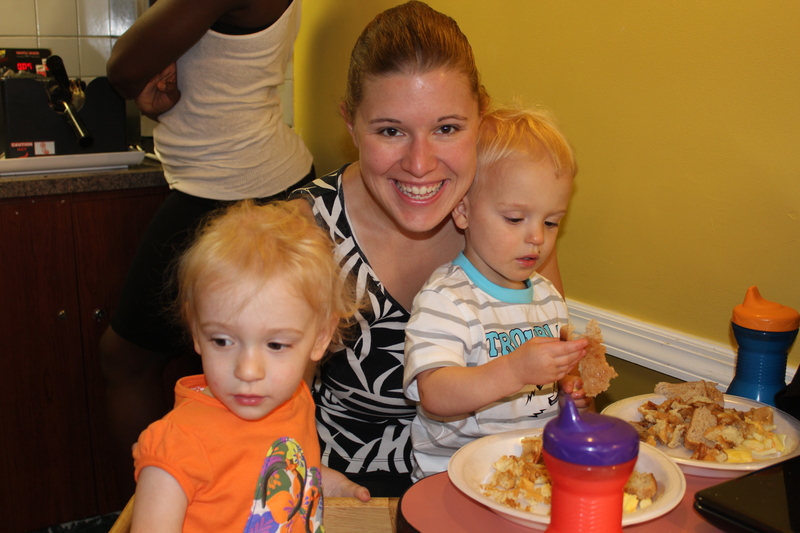 NOW: After getting the kids and ourselves ready on Thursday morning, after getting very little sleep the night before, we headed down to the free continental breakfast. First issue: No highchairs available at the moment. There were only 3 to be seen and all were taken. We did eventually get a highchair for Ariel, but then she was all mad because Will was still on my lap. Another highchair for him opened up soon after. So that was good, at least I could eat. Because they sure didn’t. There was a pretty good selection; waffles, sausage, egg with cheese, bagels, toast, cereals, hard-boiled eggs, yogurt, apples, juice, milk, coffee. We took them back up to the room to grab our stuff and I tried to get them to eat some Cheerios (which I brought with us…..gotta be prepared). They kept dumping them on the floor, so I guess they were just too excited to eat. Tim ran back downstairs to get ice for our water bottles and in the meantime Will went over to the pack-n-play and asked “nap? nap?”. Um, no. Not quite yet. 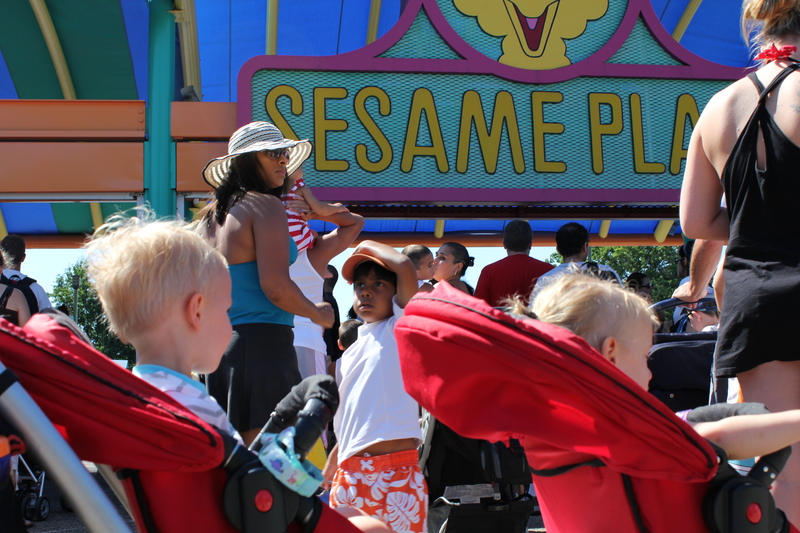 We drove about 20 minutes to get to Sesame Place from our hotel. It would have been shorter, but mapquest apparently didn’t know that you can’t make left turns or U-turns ANYWHERE. We chose preferred parking ($18) over regular ($15) because it was a little closer and worth the 3 extra bucks. We got there a little after 10 am – it’s kinda weird that it doesn’t open until 10 because it caters to little kids and little kids are always up early. This was our first “Disney Does It Better” moment because most of the parks at Disney are open at 8 or 9 am – at least at the time of year when we usually go. Our second “Disney Does It Better” moment was entering the park. At Disney you put your ticket in a machine, it slides through, you scan your fingerprint, you’re done. Here…..you gave your ticket to the attendant…..they scanned it in the machine…….you put your finger in for the print…….they gave you back your ticket……it seemed to take forever. 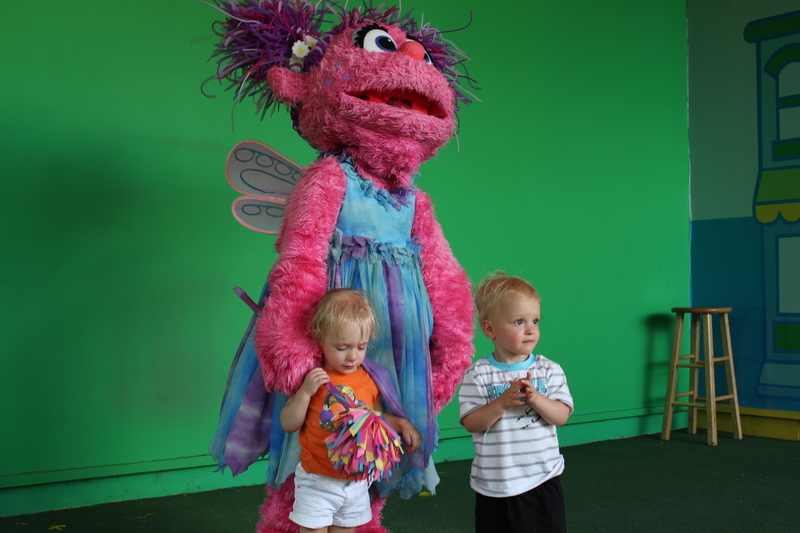 After renting a locker ($20, but you got $5 back after you turned in the key at the end) for the new camera and my purse, we headed over to Twiddlebug Land. 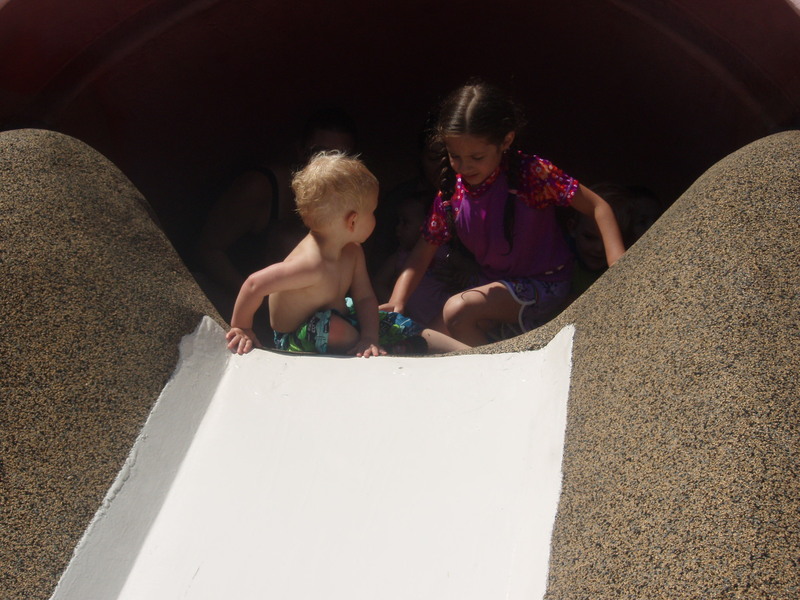 There were two larger waterslides, one with a double-inner tube and one with a large float for up to 6 people. The twins were pretty interested, but we decided to take it a little slower first. 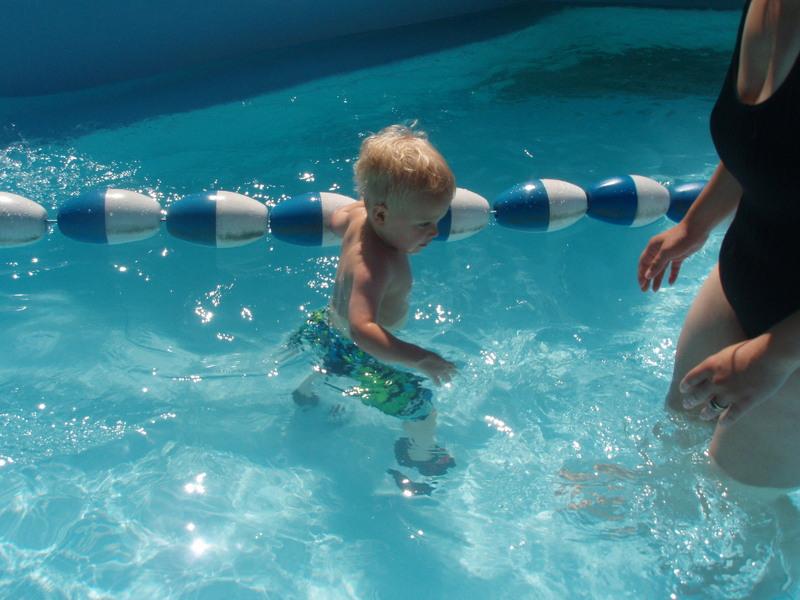 We headed over the the teeny tiny wave pool. There were spouts of water coming up, and other splashy things. We all had a lot of fun. Ariel fell once, face down, in the water, and got a little scared for a while. 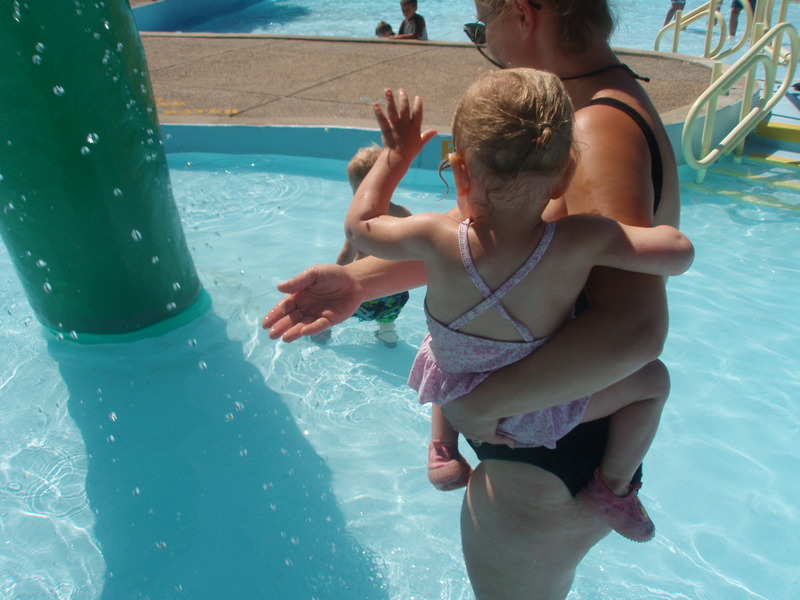 So I had to carry her for a bit, but then she calmed down and kept telling me “deep deep” because she wanted to go back in the deep water (2 feet). Then he came back around and Ariel was still trying to get up. By this time, some bigger kids were running and trying to push their way up. 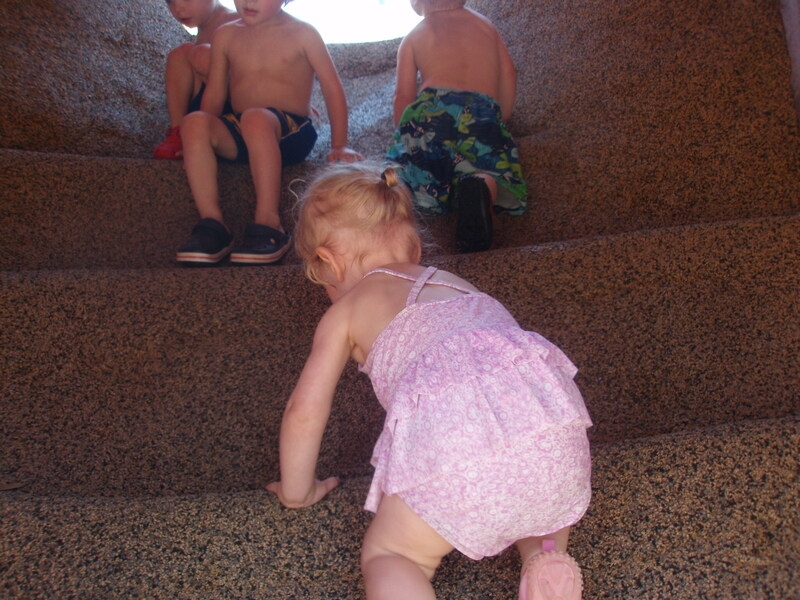 Each of the twins got a little jostled and decided they didn’t want to do it anymore, so I had to help them back down. Another mother and I said something to those bigger kids – like hello, you should wait in line, and not bump into little kids. But my kids still didn’t want to go back up. Then we headed over to Big Bird’s Lazy River. The kids needed life jackets and then I put Will on my lap and Ariel was on Tim’s. They kinda liked this. Except when they got splashed by any water that was squirting out or spraying down. So we had to work to avoid these. Because of this, we decided against going on the other raft/tube rides. 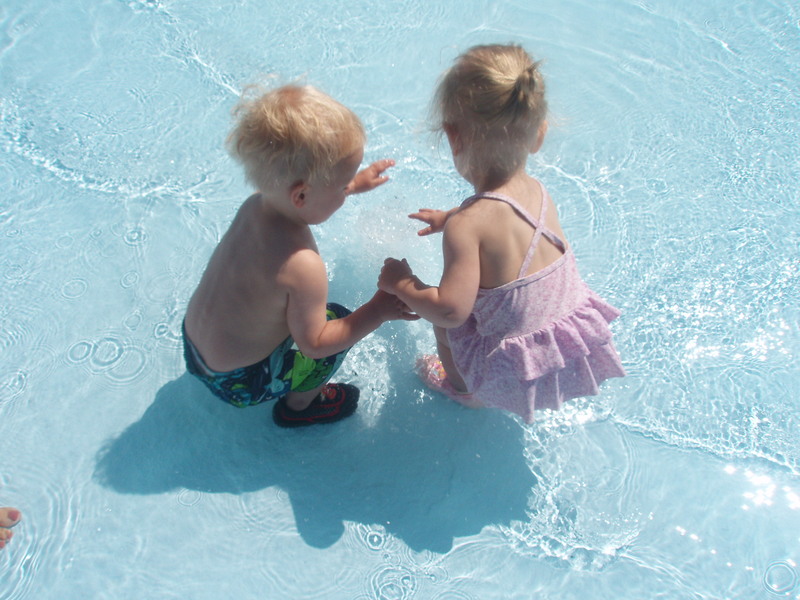 They like to splash, but don’t really like being splashed, if that makes any sense. By then, it was past noon! We didn’t realize we had been in the water over two hours! On the way to the bathrooms we spotted…….ZOE! The twins usually call her Abby though. They call all the girl-monsters Abby for some reason. I held their hands very tightly while we waited in line for our turn. Then, I just let go and they ran right for her! I also had her sign the autograph books I had made for them. After our little chance-meeting, we got the twins dried off and dressed. It was so great that there were changing stations in EVERY bathroom – even the men’s! So Tim took one kid and I took the other. Saved us so much time. We headed over to Captain Ernie’s Bistro for lunch. I wanted a Chicken Ceasar Wrap and Tim settled on the same. It was really good! We opted for a side of fruit, and also got a cup of blueberries and strawberries for the kids. Tim and I had previously decided that we had to try and eat relatively well on this trip. We weren’t “exercising” except for pushing the stoller around and walking and we didn’t want to come back having gained a ton of weight just because we had burgers instead of chicken. We had brought the kids’ leftover pasta from dinner the night before for their lunch. The twins were getting mighty crabby at this point. They were way tired. 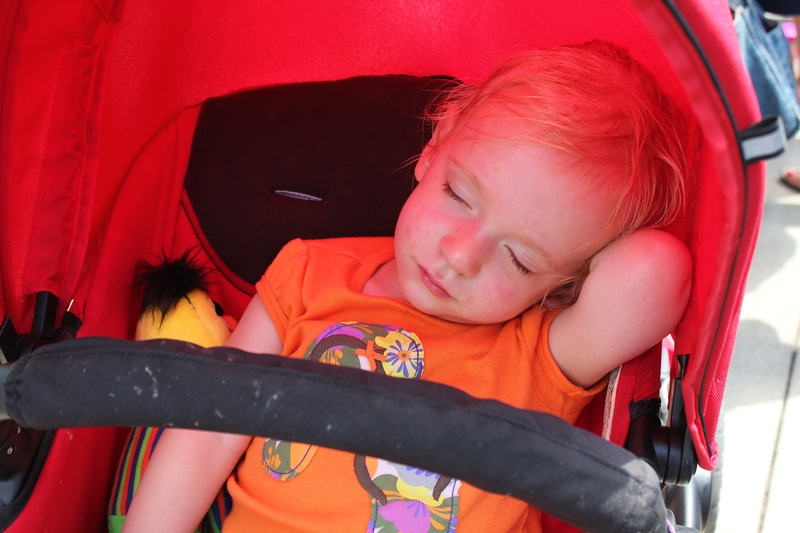 So we figured we’d just walk around a bit after lunch to see if they’d take a little nap in the stroller. 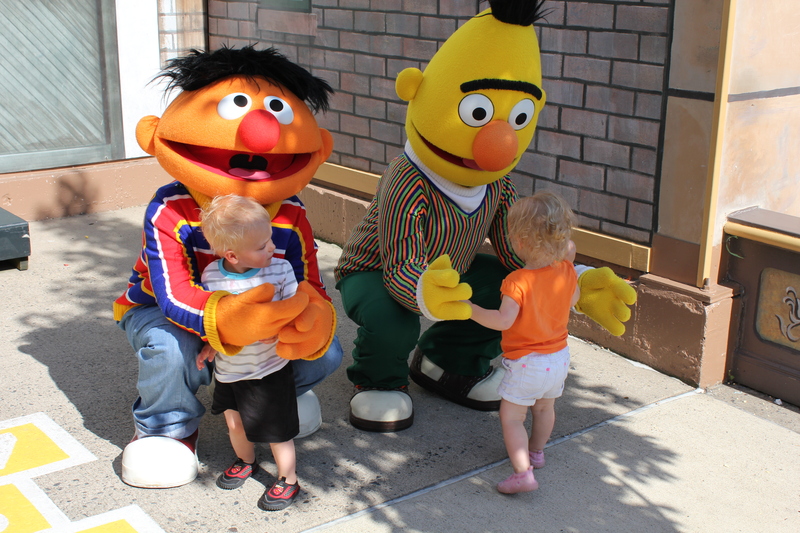 We also stopped at Mister Hooper’s Emporium to buy them each their first souvenier – a stuffed Telly for Will and a Bert for Ariel. We thought maybe if they held onto them, they’d be more likely to snuggle up and fall asleep. We also refilled their juice cups. I had given them water first but they basically refused to drink it. I always try to mix their juice half with water, and I figured it was so hot I didn’t really care what they drank as long as they were hydrated. They just kept insisiting on juice. 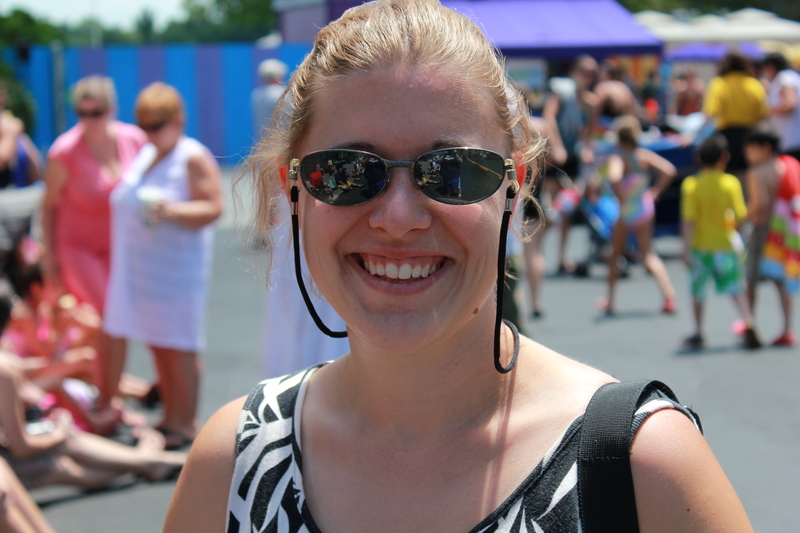 We walked around a bit and then got settled into a spot for the afternoon parade (2pm). Here we are, all waiting for the parade. We had to try our best to keep Will entertained so that he wouldn’t kick his sleeping sister, who was in front of him in the stoller. 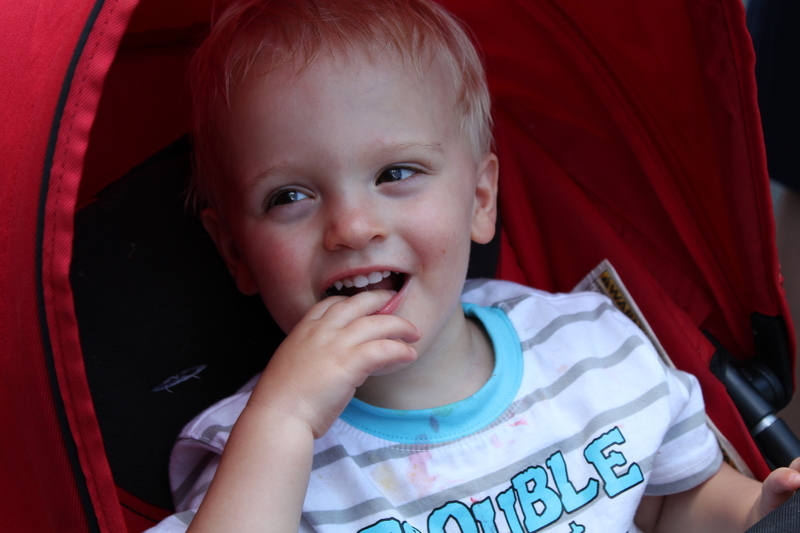 But he did pretty well – it was hot – he was sitting still – he had no idea why we were waiting. But once he found out….I don’t think I’ve ever seen him SO FRIKKIN’ EXCITED!!! My eyes were welling up with tears. THIS is why we had come here. For THIS reaction and this experience. 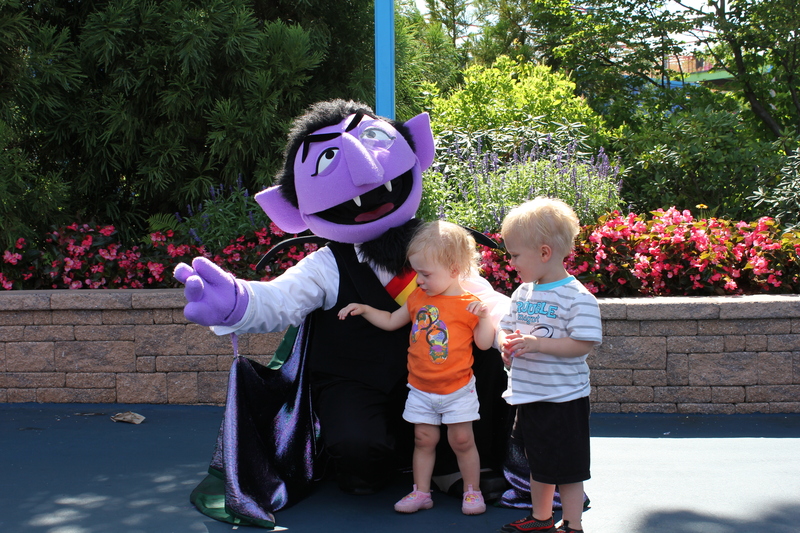 He kept yelling out the character’s names as he saw them, and screaming “coming coming!” He was dancing and partying like crazy. Ariel was still sleeping but that was ok, she woke up near the end. And this is our third “Disney Does It Better” moment. If you’ve ever seen a Disney parade, you realize it repeats as it goes along. This is for the sake of everyone along the parade route – no matter where you are you see virtually the same “show”. At Sesame the parade stopped towards the beginning and the show went on and by the time it got to us the show was pretty much over. The characters were still dancing and singing and stuff, but we decided we had to be up front if we watched the parade again. We left the parade pretty happy though. Except for Ariel. Even with her little nap she was still kinda miserable. Earlier she had been rubbing her eyes on her arms and got suntan lotion in them. Her eyes were still all red and puffy even after I rinsed them out with water multiple times and washed her hands. I thought her nap would have helped, but she kept complaining her eyes were still bothering her. 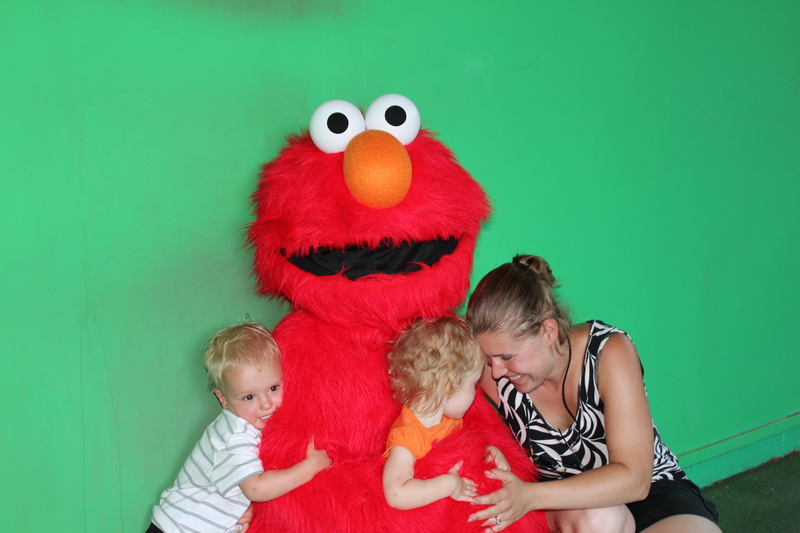 Elmo’s World Live! was starting in a half-hour, so we headed over to get in line. Ariel was still whiny through basically the whole show, but she did seem to enjoy it. 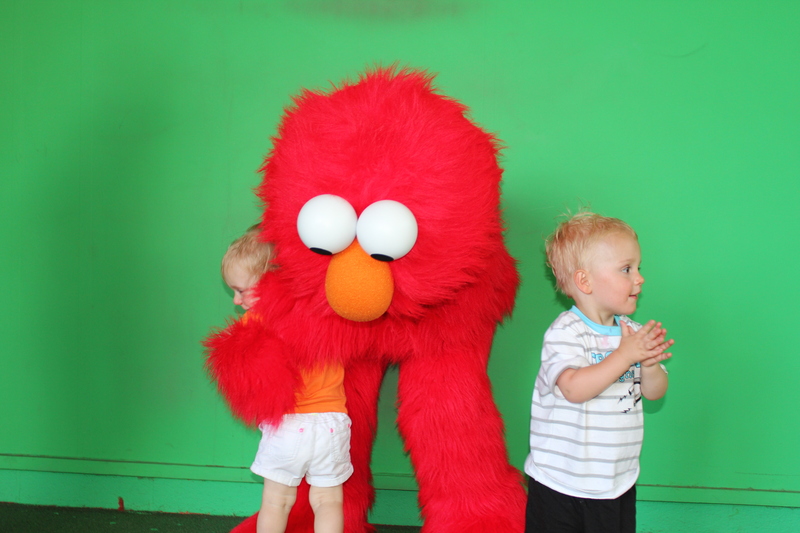 We figured if anything could help, it would be seeing Elmo. Will loved it! He was dancing and laughing and calling to Elmo and Mr. Noodle. 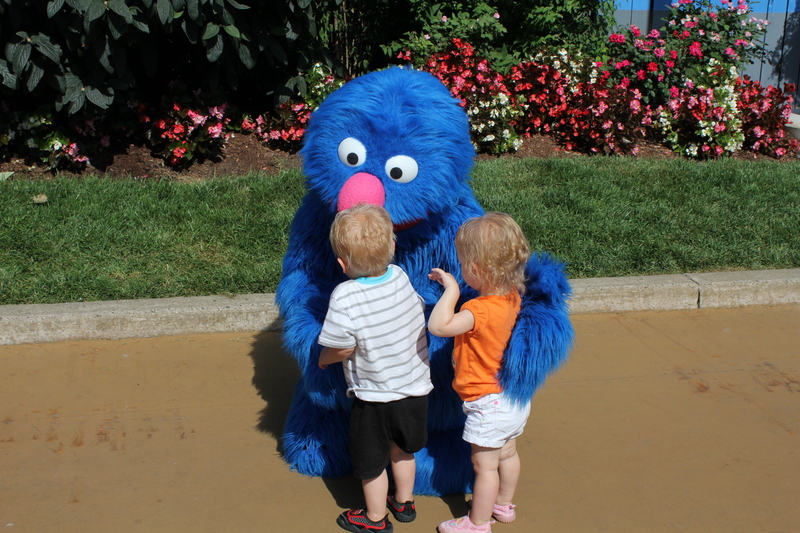 We were walking back up the main area and spotted Grover! 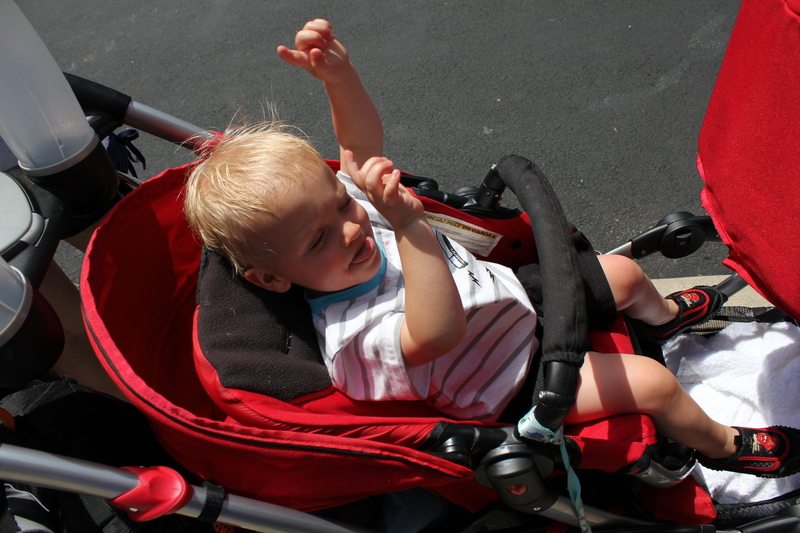 And this was all with Will still not having a nap,and Ariel moaning and groaning while in the stroller because she was still so tired. 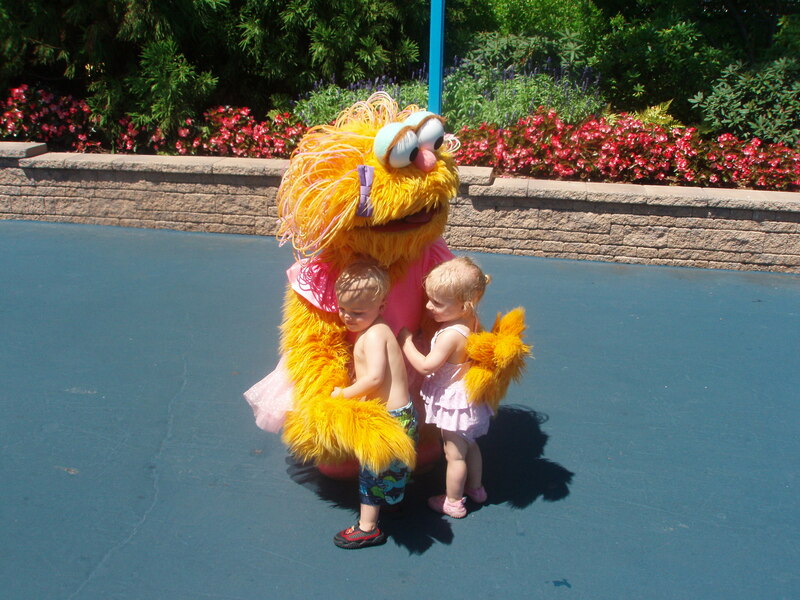 But every time she got out to hug a character, we could tell she really was enjoying herself, despite her red-rimmed eyes. We asked the twins if they wanted to go have dinner, or find more guys. “GUYS GUYS!” they both shouted. Tim and I weren’t too sure – it was already almost 6, but we decided to go with what they wanted. We headed to the back of the park where 1-2-3 Smile With Me was located. 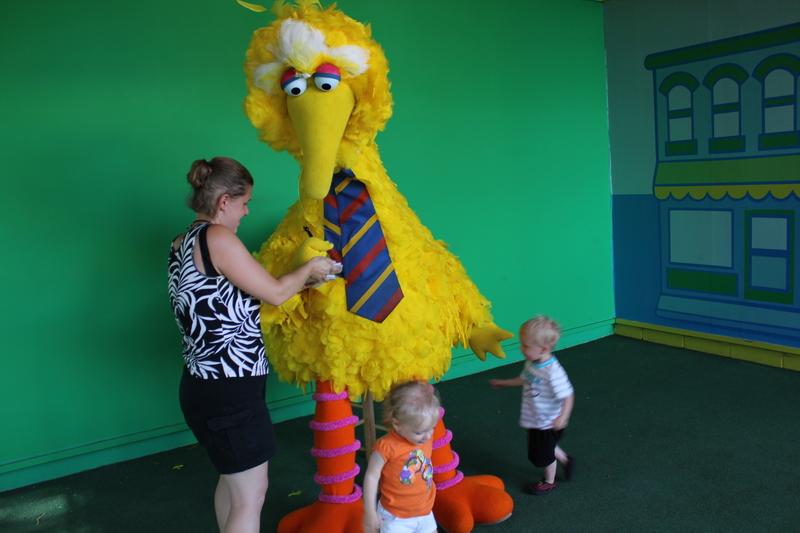 Here, you can see Abby or Big Bird, and Elmo pretty much any time of the day. By this time, Will had caught on to the autograph book and was pointing excitedly back and forth to the book and the guy. He was also saying “thank you” as the guy signed. What nice manners! There was really nobody back there at this time of day, so they got a lot of one-on-one time with these characters. 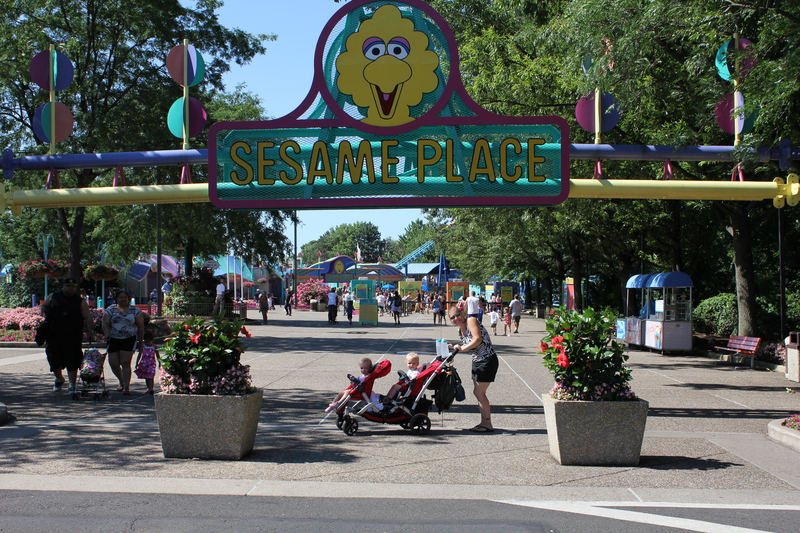 We went through the “line” twice – once to see Abby and Elmo, and when Abby and Big Bird switched, so we went through to see Big Bird and Elmo. We piled into the car at this point to drive a short way to T.G.I. Fridays for dinner. Before we even left the Sesame parking lot, the twins were asleep. We decided to just get our food to-go and eat in the car. 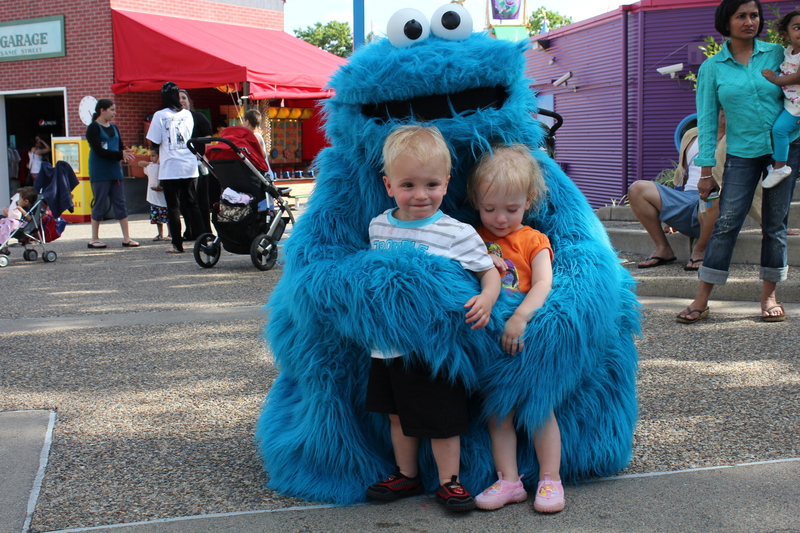 Depending on what kind of mood they woke up in, maybe we’d go back to Sesame Place and they could just eat dinner there. They slept while we ordered and waited. Then, just as we started eating, they woke up. Will was screaming. Ariel was fine because she realized we had french fries (The Count’s French Fry Count; that’s 2, 2 meals with french fries, ah, ah, ah). We figured Will must still be tired so we headed back to the hotel. Well, that was apparently the wrong move. They were wired from their 45-minute nap. We should have just gone back to the park. They ran around the hotel room while Tim and I took showers and got stuff ready for the next day. We gave them baths and then put them in the pack-n-plays. Not wanting to make the same mistake as last night, we left one light on so they could see we were still there, but got into bed ourselves, too. We had to turn the light off after about 15 minutes of them throwing their toys out of the crib, giggling like maniacs, and asking us to pick them up again. Better than the screaming from last night. Even after the light was out they continued to play. They finally laid down and fell asleep around 10pm. This is when Tim said we should have just gone back to the park. But oh well……..they probably would have been acting like that until midnight then. They slept all the way through until 7:30 without incident. Better than the night before. 🙂 This is now.